A few weeks ago, I gave a talk to a group of PhD students about academic blogging. This summer, I realised I had been blogging for five years, since I was a PhD student myself. While I'm not by any means an expert, I have managed to gather quite a few do and do nots around blogging about research. Preparing for that session, I realised that while there was a whole load of helpful information out there on blogging, there wasn't really any one resource that gathered it together, particularly from the perspective of a PhD student starting out blogging for the first time. So, here's the information I gave those students (who may or may not have found it helpful). Feel free to use this yourselves if you're doing something similar for students or colleagues (crediting the resource creators, of course). Why should I blog about my research? Blogging or otherwise talking online about research has been a hot topic this year. 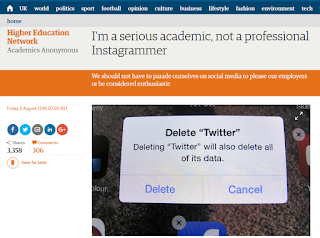 At the start of August there was a Twitterstorm about being a #serious academic, after this Guardian article was published criticising academic blogging as not serious. Surely the dedication I show in the lab, and the subsequent data I collect, should speak for itself. I do not – and should not – have to parade myself online to please my employer or to stake my claim as a good researcher. Can’t we save the showing off for where it’s really needed, in the dreaded grant applications? The (anonymous) author may have had a point, but many MANY others have talked eloquently and persuasively about their #serious and #notsoserious reasons for blogging and tweeting about their research (e.g. Rachel Moss, History, University of Oxford, The Tattooed Professor aka Kevin Gannon, Professor of History at Grand View University in Des Moines, Iowa, and Stirlingretail aka Leigh Sparks, the Institute for Retail Studies, University of Stirling). For me, there are three reasons why talking about research online is helpful. Recognition – it gets your name out there and associates you with a particular research topic (useful for job applications and conference invitations). It can also draw attention to your publications (altmetrics can show where people have accessed your papers from a Facebook post, for example). Networking – it’s much easier to connect with other researchers if they know you exist and what you do. It’s a fundamental part of academic research – public engagement/outreach is a core part of research and something you’ll need to demonstrate in an academic career. Making a pre-publication version of your journal articles publicly available is also important to meet REF (Research Excellence Framework) guidance in the UK. What kind of social media should I use? Blogging – blogs are a great place to hash out ideas, review books, talk about teaching, and to store those ideas that don’t fit in your thesis. Longer posts mean you can explore a topic in greater depth. Common academic blog sites include: Wordpress, Blogger, Tumblr, Medium. Twitter – there's a huge academic community on Twitter - look for relevant hashtags (e.g. #medievaltwitter or #twitterstorian) and follow other researchers. Twitter is, of course, very short form (140 characters) and is more helpful for pointing to longer pieces. Academia.edu or LinkedIn – A sort of professional social network, this can be a place to post longer, more formal publications, but you can also publish or link to your blog posts here. Whatever you use, make sure you connect up your social media (so Tweet about your blog posts, consider including your Twitter feed on your blog site). Read other blogs to get a sense of what you want from your own. What kind of blog is it? What do you like about its content and style? What don’t you like? What is the blog’s purpose and audience? You can read lots of examples of PhD student blogs on the Thesis Whisperer's site. Browse these Twitter hints for newbies by @georgejulian. A helpful slide show from Helen Dixon on blogging research. You can blog about many things (teaching, an event, a book review). These tips are helpful for thinking about what to write about. How to turn a journal article (or a thesis chapter) into a blog post (Medium). Images are always great for making post look more appealing, but make sure you have permission to use them. Here’s where to get free images for your blog. Don’t worry if you’re not getting tons of hits. These will build up as you develop your online network, and you’ll get a lot of lurkers – I’ve had people come up to me at conferences in the past to say they’ve enjoyed my blog posts, but they’ve never commented! Use your analytics. Twitter, Wordpress, Blogger will all tell you who is viewing your blog, when, and how they accessed it. Use these to get more views for your blog (for example, if most people read your blog in the evening, think about publishing a new blog post then). Put your Twitter handle and blog site url on your conference slides – it means people are more likely to mention you when they tweet your presentation and you can follow up on connections afterwards. Finally, here are five things I wish I'd known when I started blogging. These are the main things that I wish I had thought about when I started blogging five years ago. Every blogger will have a different list, but here are mine. Think about your blog title and Twitter handle – will it still work in 5 years when you’re researching something completely different? Top tip: if dr[yourname] is available on gmail or Twitter GRAB IT NOW. If you want to get an audience for social media, you need to post regularly. Don’t underestimate the time commitment (and don’t let it get in the way of other stuff you’re doing). Plan what you might write about for the next 6 months – are there any events you’re attending that you can write about? If you’re not sure you can devote regular time to blogging, why not set up a group blog to split the work? Collaborative blogs can produce a lot of content – multi-author posts are better for a shared purpose (i.e. research centre or project). On a related note, you can contribute guest posts for blogs with bigger audiences – some will commission posts on particular topics. You can often cross-publish on your own blog, and gain more readers. You don’t have to separate your personal and public profiles online (unless you want to). I tried to do both, but found I neglected my public research profile, Now, I use Twitter for research and general chat, Facebook for friends and family, and blogging for research. You can also use a pseudonym (e.g. the Tattooed Professor, The Thesis Whisperer) but think about how you want to use your blog (i.e. if you want others to know what you do professionally if you don’t include your name this won’t work). But, bear in mind your digital footprint. If you’ve never done it, Google yourself this afternoon and look at what comes up. Is it what you want to come up? What would you like colleagues, interview panels, and other researchers to see? Read other blogs to get a sense of what you want from your own. What kind of blog is it? What do you like about its content and style? What don’t you like? What is the blog’s purpose and audience? Writing for the web is different to academic writing. The posts where I copied and pasted my thesis content were the least interesting and the least read. You’ll need to rework your academic writing considerably, removing any jargon, and bearing in mind that readers will need introducing to unfamiliar texts, theories, and jargon.